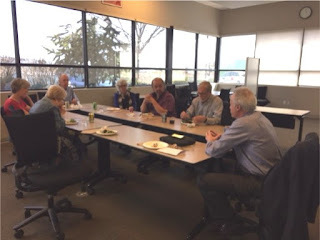 A couple of weeks ago, I had the pleasure of meeting with local community leaders and longtime supporters of Imagine! to discuss the current state of Imagine!, as well as the future of services for people with intellectual and developmental disabilities living in Boulder and Broomfield counties. We shared ideas and explored challenges and areas of opportunity. We are so fortunate at Imagine! to have access to community leaders who are willing to act as a sounding board as we work to create a world of opportunity for all. Meeting attendees included Imagine! Foundation Executive Director Patti Micklin, Longmont Mayor Leona Stoecker, former Imagine! Foundation Executive Director Susan LaHoda, Foundation Board member Walt Pounds, former Foundation Board member Kathy Coyne, former Boulder City Council member George Karakehian, and former Foundation Board member Jay Montgomery. I thank them all for their insight and wisdom, as well as for their belief in the potential of all. Third Thursday Happy Hour Supports Imagine!